"Swish". That's the sound you associate when a basketball player puts the ball through the hoop and hits "nothing but net". Is there a golf equivalent? Maybe it's "Ka-Ching"? Because after acing the 17th hole at the Porsche European Open in Hamburg yesterday, that's exactly what Marcel Siem heard. 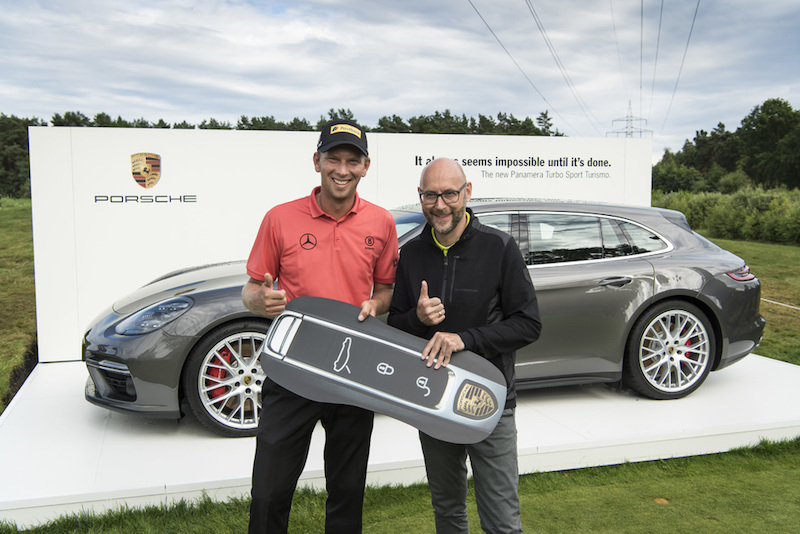 For placing the ball in the cup with just one stroke the German pro won a Porsche Panamera Turbo Sport Turismo. Watch as the 37-year-old takes his 7-iron and scores a hole-in-one at the spectacular 170-yard, par 3 hole on the Green Eagle golf course. Oliver Eidam, Director Brand Partnerships & Sponsoring Porsche AG, handed Siem a symbolic, outsized car key after his fantastic shot. Watch it below. We slowed down the video of the ball going in the cup so you can actually see it happen. Asked how he felt about winning the Porsche, Siem had this to say, “Today’s hole in one was my third on the European Tour,” said Siem. “So far, I'd had a handshake and a bottle of champagne - and now, finally, something useful.” A bit of an understatement, don't you think? ls that a Mercedes Benz logo on Marcel’s Polo top, ‘um’. Good shot the hole in one.